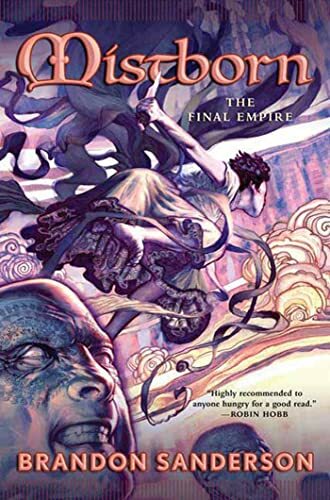 The promotional material for Brandon Sanderson's Mistborn: The Final Empire represents the novel as a fantasy that "dares to turn a genre on its head" by asking the question "What if Frodo failed?" Set in a dark fantasy landscape where the prophesized hero failed to save the world, Sanderson's novel ultimately does defeat expectations, just not in the manner advertised. Mistborn focuses on the adventures of two rebels trying to overthrow the Dark Lord's empire from within. Kelsier is a charismatic thief whose disengagement with politics came to an abrupt end in the Lord Ruler's most notorious prison. In a moment of intense emotion, Kelsier "snapped" and discovered that he possessed the powerful magic of a Mistborn, the elite magicians of the ruling class. Having escaped from prison, he begins assembling a crack team of rebels, con artists, and thieves for the ultimate job: engineering the downfall of the empire. Although Kelsier is introduced first in the novel, the real hero is his young sidekick, Vin. Like Kelsier, Vin is a member of the oppressed skaa, the racial group whose slavery and exploitation form the economic backbone of the empire. Despite the fact that interracial children are prohibited, Vin has mixed ancestry, and as a result has also inherited magical abilities far above her station. Kelsier rescues Vin from a miserable existence as a low-ranking member of a brutal gang, and brings her into the plan to overthrow the empire. Over the course of the novel, Vin learns to overcome the paranoia fostered by a life on the streets and trust Kelsier, even as she struggles to master her considerable powers. But her experience masquerading as a young noblewoman drives a wedge between pupil and mentor when Vin falls in love with a member of the very class Kelsier is determined to destroy. Does Mistborn ultimately succeed in revolutionizing the fantasy genre? Of course not. Despite the disparaging comments fantasy fans make about "Chosen One" stories, there are actually relatively few novels that follow the formula to the letter. Even Robert Jordan's Wheel of Time series, which makes obvious use of this plotline, innovates by having the Chosen One pose almost as great a threat to the world as the Dark Lord himself. Asking what happens if "Frodo fails" is thus not as earthshattering as Mistborn 's marketing would have us believe. After all, in the book that started it all, Tolkien's The Lord of the Rings , Frodo does fail: it's only by the grace of God and Gollum's gnashers that Middle Earth is preserved. For all that Mistborn 's publishers claim it reinvents a clichéd plotline, it ends up following the Chosen One storyline more closely than many other novels. Vin and Kelsier are, after all, ordinary folk with extraordinary destinies, low-ranking members of society who have inherited rare and powerful magical abilities and are thus in a unique position to oppose the Dark Lord. They are, in short, Chosen Ones. The fact that no prophecy exists to assure us of their eventual success does not really change the fact that we expect them to eventually triumph over the Lord Ruler and whatever Forces of Darkness he represents. But that is not to say Mistborn is without originality. The magic system Sanderson has developed for this world—magicians must "burn" ingested metals in order to activate their powers—is both unusual and well thought out. It also allows Sanderson to adapt the heist plot to a fantasy world in a way that makes sense: in stealing vast quantities of a rare metal, Kelsier and his team will not only inflict vast economic damage on the Lord Ruler but also diminish his access to military magic. The characters of Vin and Kelsier are standard fantasy rogues, cut from similar cloth to the thieves and assassins of Steven Brust's Taltos books. Indeed, at its best, Sanderson's fast-paced romp through a grimy fantasy city is reminiscent of Brust's early novels. At times, however, Sanderson's downtrodden characters seem too idealistic and morally upright to be believable. This comes across most strongly in the case of Vin, who has endured a lifetime of physical abuse and has been taught, quite literally, to trust nobody. But, being a good kid at heart, a good wash and bit of etiquette training enable Vin to shed the scars of her childhood with relative ease. Gritty character realism this is not. Nevertheless, both Vin and Kelsier are engaging, and once an uneven first section is out of the way, their adventures make for entertaining reading. Sanderson is a competent new author writing for an action-oriented audience, and as a result he makes sure that combat scenes occur frequently in the plot. He's writing fiction that's clearly several cuts above D&D fare in terms of quality, but which will appeal to readers who prefer highly visual, action-driven writing. There are times, however, when the author seems to put his brainstorming directly into the mouths of his characters rather than allowing his dialogue to grow out of his characters' motivations. Early on in the novel, for example, there is an extensive scene in which the characters come up with a plan to destroy the empire. While the scene is well-written, it doesn't seem likely that a newly formed team would be comfortable with the degree of planning Kelsier is willing to turn over to them, particularly when they have recently acquired a new and untried member. What appears on the page as the characters trying to generate a plan thus comes across more as the author trying to think on his feet about what Kelsier's plan could entail. Perhaps as a result, Mistborn 's plot sometimes lacks coherence: the "heist" dimension of the novel, while an interesting idea, ultimately takes a backseat to Vin's political education and Kelsier's one-man crusade against the empire. But these are also the sections of the novel that prove most intriguing, with Vin emerging as an independent thinker and a powerful magician in her own right. Sanderson invests the story with enough twists and turns to keep most readers guessing and concludes with a surprising plot development that promises good things for the other two novels in the proposed trilogy. Sanderson also has adopted the strategy of putting extensive annotations to his chapters up on his website, so that fans of Mistborn can have easy access to the literary equivalent of DVD extras. While website material is usually designed to stand separately from the work in question, Sanderson's comments relate so closely to the material that they really serve as a running commentary on the book. Readers who are interested in the thought that goes into literary productions might want to seek out Sanderson's work precisely so they can read the two in conjunction. Siobhan Carroll is a doctoral student at Indiana University. Her short stories and poetry have appeared in magazines such as On Spec , Room of One's Own , and Son and Foe .